It's believed to be the oldest time capsule in the entire country. By Steve Annear·	 12/11/2014, 11:28 p.m.
Before there were squabbles at the State House about designating the official sandwich of the Commonwealth, funding the MBTA, and legalizing medical marijuana, Paul Revere, former governor Samuel Adams, and other notable historic figures put a time capsule inside of a granite block and then placed it at the base of the state’s Capitol building. On Thursday, after hours of meticulously chipping away at the slab of stone it was embedded in and wiping away the dusty debris, the small box, which reportedly contains relics dating back to 1795, was successfully removed and shipped off to the Museum of Fine Arts for an X-ray to reveal its contents. It’s believed to be the oldest time capsule in the entire country. According to the State House News Service, it took Pamela Hatchfield, a preservationist for the museum, nearly the entire day to gain access to the time capsule because she feared it would get damaged if she didn’t carefully excavate the item. The contents of the time capsule remain a mystery, but preservationists believe that the copper box contains old newspapers and coins, and perhaps other paperwork that’s more than 200-years-old. Museum of Fine Arts officials told Boston in an email Thursday that they’re working with the State House to provide conservation consultation and services for the project at no cost, and they will X-ray the box this weekend. The public likely won’t find out exactly what’s inside of the time capsule until sometime the following week. Adams, Revere, and William Scollay first placed the time capsule in the stone block back in 1795. It was removed from the granite nearly 100 years later, in 1885, when it was discovered during a restoration project, according to the State House News Service. At that time, items were then added to the capsule, before it was placed back in the same spot. It remained dormant until Hatchfield pulled it from the cornerstone on Thursday, so construction crews could continue work on a water infiltration project at the building. 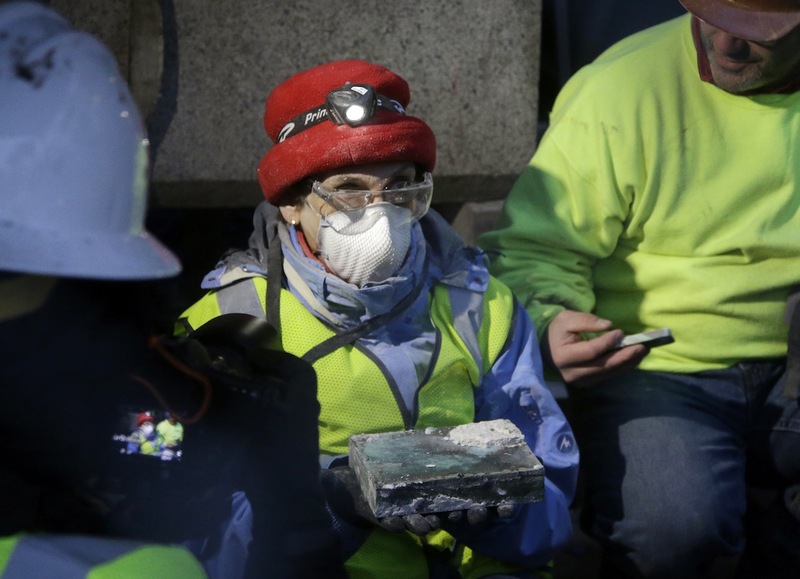 The time capsule’s removal comes just one month after historians from the Bostonian Society uncovered a similar relic hidden in the crown of the lion statue that sits atop the Old State House. The contents of that time capsule, which included a letter to posterity, pins, and old photos, were preserved and put on display before officials filled a new box with items—including a letter from Boston—and stuffed it back into the sculpture for residents to discover in another 100 years.